Water Cooled Chillers : Water cooled chillers are typically indoor installation and operation, it’s are cooled by a separate condenser water loop and connected to outdoor cooling towers to expel heat to the atmosphere. The Water cooled chillers are normally packaged, complete and closed-loop systems Include the condenser, pumps, chiller, temperature control systems and associated valves. Circulates water or any other coolant at constant pressure and temperature. The coolant flows from the chiller to the point of application and back again. Refrigeration is used as the cooling process in most of the industrial chillers. Some depend on air or water that flows over the coils containing a specific coolant in order to regulate the temperature. The coolant that is used most commonly in process chillers is water, though coolant mixtures are employed frequently. The latest development in industrial water chillers is the utilization of water cooling rather than air cooling. The condenser cools the refrigerant with water and not air. A cooling tower cools the air, thus reducing the need for energy as well as the chiller size. This is because of the condenser's small surface area and the lack of cooling fans which minimizes the noise levels too. Chilled water or other liquid from the chiller is pumped through process or laboratory equipment. Industrial chillers are used for controlled cooling of products, mechanisms and factory machinery in a wide range of industries like. 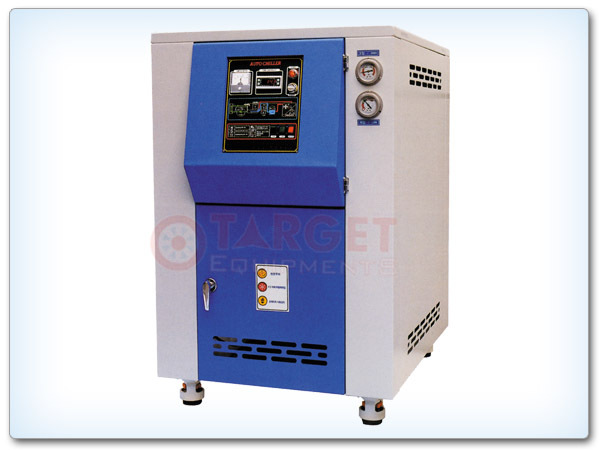 Target chiller used to cool high-heat specialized items such as MRI machines and lasers, and in hospitals, hotels and campuses.